Beauty oils are a versatile and valuable addition to any daily beauty regime. Editor Trudi Brewer shares an natural, locally made oil that is also a labour of love. There is nothing unusual about slathering oil onto your skin to nourish and illuminate your complexion today, but 25 years ago it was a different story. When Christchurch-based Linden Leaves founder Brigit Blair decided to turn her hand to making natural skincare to heal her children’s chronic skin ailments she was an anomaly. Remedies used for skin conditions back in 1994 were not natural, they did not have a pleasant scent and were certainly not infused with fruit or flowers. 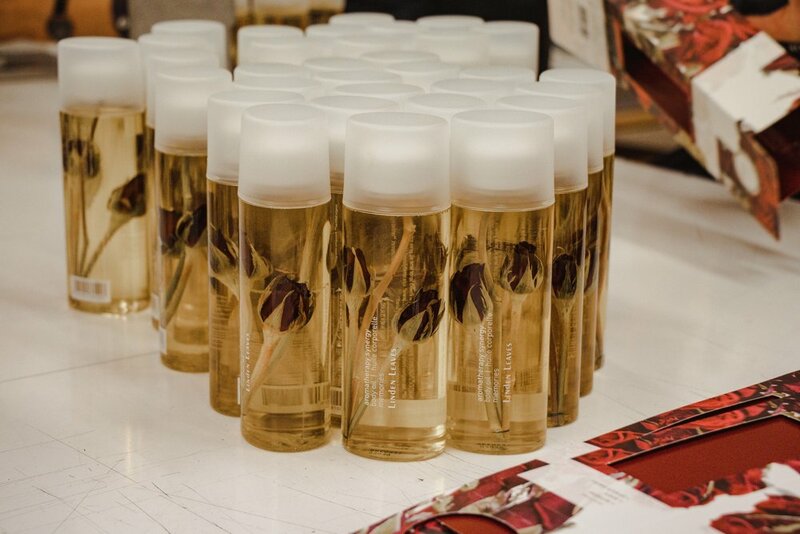 Fast-forward to 2019 and the range of Linden Leaves Body Oils Blair created out of pure frustration are top-sellers. “The children were brought up on a variety of steroid creams for chronic eczema, and I kept thinking there has to be another option,” explains Blair. “I knew there had to be a more natural way to heal the skin, but back then the green wave had not started. However, I was determined to try other options.” While she admits she did not find a cure (steroid creams didn’t cure the children’s skin ailments either), “the oils were certainly a much kinder option for the skin long term”. Multi-purpose and pretty, the Body Oils, are a blend of cold-pressed certified organic rosehip, certified organic avocado, sweet almond and apricot kernel oil, infused with essential oils such as rose, geranium, and ylang ylang for fragrance. Each bottle contains rosebuds, lavender and larkspur or a selection of seasonal fruits – think tiny wild apples, lavender, lemons, strawberries and tamarillos – immersed in the heavenly scented, fast-absorbing oil. The most labour-intensive product in the range, the oils are made in Christchurch at Linden Leaves HQ. The best-seller, and Blair’s personal favourite, is the Memories Oil. The rosebuds used in the oil are grown exclusively at Moffatt’s Flower Company, in Halswell, just 15 minutes from Christchurch CBD. 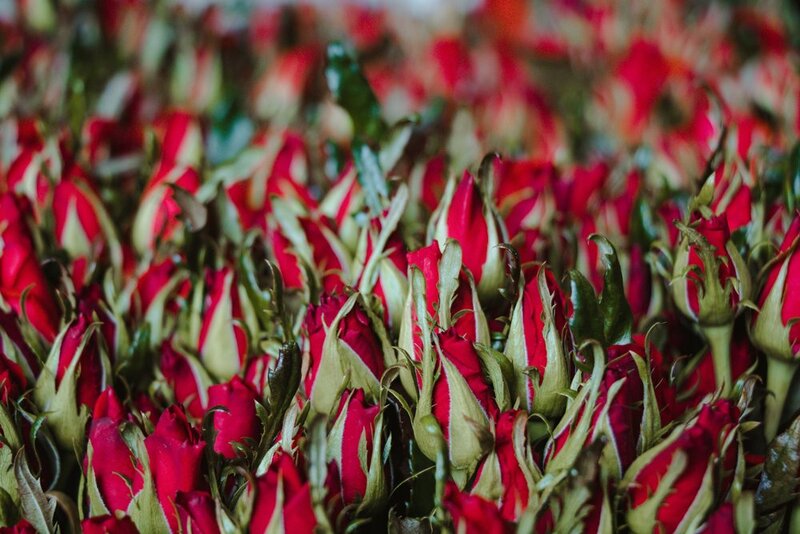 The team at Moffatt’s grows a tiny rose exclusively for Linden Leaves, and each year the crop size is increased. After months of trial and error, this bud was selected not only for its size (it is small enough to slip into the oil bottle) but also for its ability to hold its colour once dried. 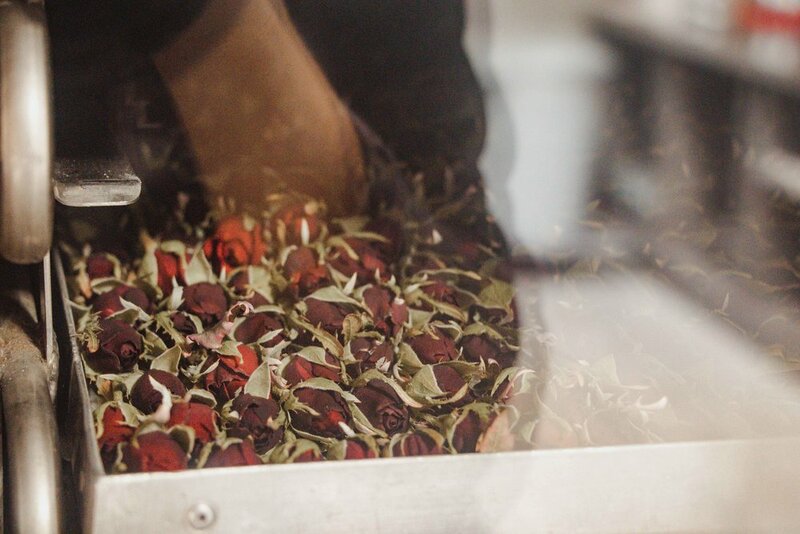 Between two and seven thousand fresh roses arrive in buckets at Linden Leaves each week, the leaves are stripped by hand and the buds and stems are layered onto trays, which go into the freeze dryer. This machine works around the clock and is tended by Blair herself, who scrapes the ice from the base 365 days a year. 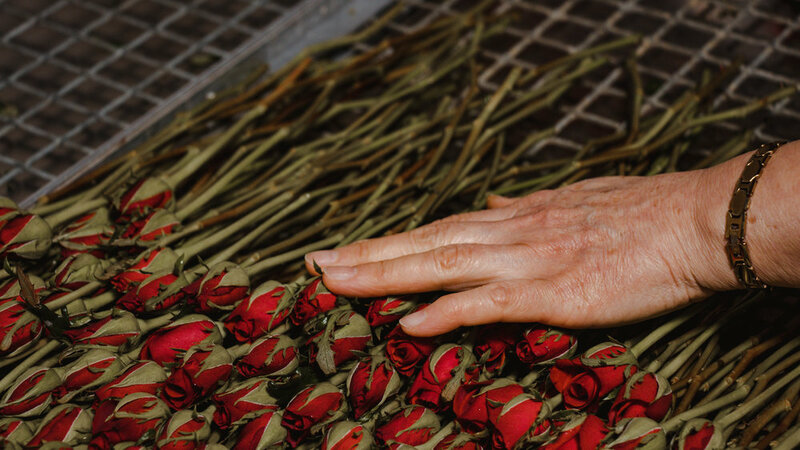 “There are often 7,000 roses in the freeze dryer at any one time, so I don’t want to risk them spoiling,” she says. “It doesn’t take long to clean and for me, it’s part of the job, I love what I do.” The seasonal fruits are sliced by hand and then frozen until they are ready for production. Most of the fruit-picking is also done by Blair, who admits she is at the mercy of Mother Nature. “Some seasons are not great. Last year the strawberry and lemon season was terrible, but that’s part of the joy of relying on locally grown produce,” she says. With a memory map of where wild apple trees can be found on the outskirts of Christchurch, it’s often all hands on deck to get the new-season harvest picked before the apples grow too large (they must be small enough to slip easily into the oil bottle). “A local farmer grafted some apple trees for us a few years ago which we planted outside the office, so there isn’t far to go to pick the apples now,” laughs Blair. 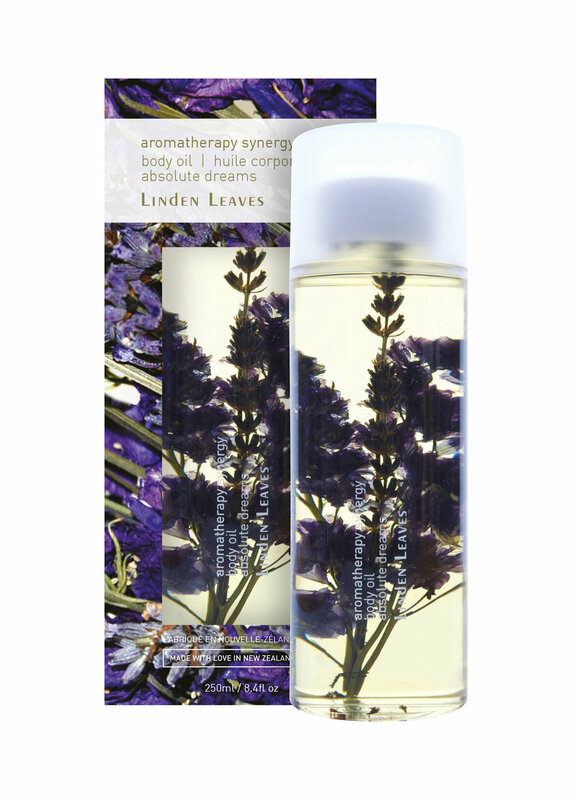 Linden Leaves Aromatherapy Synergy Memories Body Oil, $64. Linden Leaves Aromatherapy Synergy Pick Me Up Body Oil, $64. Linden Leaves Aromatherapy Synergy in Love Again Body Oil, $64. Linden Leaves Aromatherapy Synergy Absolute Dreams Body Oil, $64.